Dr. Louis R. Negrete was born and raised in Los Angeles. During his distinguished career, Dr. Negrete served as Director of Project Head Start for the Council of Mexican American Affairs and was also a founding member of the new Chicano Studies Department at the California State University in Los Angeles. He served as professor of Chicano Studies for some 35 years at Cal State LA. CHICANO HOMELAND is his first book. Dr. Negrete makes his home in Los Angeles, California. 1: Can you tell us what your book, Chicano Homeland, is about? My book is about activist Chicano organizations that fought against anti-Mexican racism in Los Angeles during the 1960’s and the 1980’s. It describes how they opposed police mistreatment, schools that didn’t teach, and general discrimination in society. The organization and struggle of the united farm workers for just salaries encouraged community groups to oppose injustice. At the same time, reports of unfair rates of killing of Spanish Surname and Afro-American soldiers in Vietnam generated anger expressed in open opposition to the war. The Chicano movement, as activists called themselves, became an important part of the national civil rights movement. A younger generation of activists formed the Brown Berets to confront police mistreatment and the Chicano Moratorium Committee attracted thousands of supporters to movement events. Much protest events expressed defense of immigrant families. Other activist groups included in the book were also part of the growing movement. 2: Why did you write your book? I believe that all minority groups must fight back against racism in local and national politics. The Chicano movement was successful as evident by an increase in Mexican Americans and other Latinos now employed as police officers, teachers, government workers, medical staff, nonprofit agencies, business, all across the range of employment and careers, including election to public office. But persistence of continuing poverty and homelessness in Latino neighborhoods must compel the younger generation of activists to keep the movement alive. Anti-immigrant government policies popular today pose a major threat to democracy. The Chicano people and Latinos, especially younger generations, must fight racism. They must know about the Chicano movement as part of their own national history. 3: What kind of message is your book trying to tell your readers? All people who immigrant to America face hard times. They manage to overcome economic and social barriers to become true Americans. They also resist racial prejudice and assist other immigrant communities to survive as Americans. The national civil rights movement involved people from many immigrant origins, including Mexican Americans. My book tells the history of how Chicanos fought to claim an American identity like other minority groups. This is an important part of American history. 4: Who influenced you to write your book? No one in particular influenced me to write my book. My teaching experience as a university professor made me realize that I should write about what I learned based on what I observed and experienced. I marched with community activists and attended protest events off campus. I also dedicated much time to building the Department of Chicano Studies at California State University, Los Angeles. 5: What kind of advice would you give to other non-fiction authors? Enjoy your writing. Be honest in what you write about based in part on your own experience. Los Angeles author-educator Dr. Louis R. Negrete lived and now tells the compelling, dynamic story of the movement for the rights of Mexican-Americans in the USA, particularly those In California. In his riveting, powerfully written historical book, CHICANO HOMELAND, retired college professor Dr. Negrete vividly describes the issues that sparked the Chicano civil rights movement, that saw unbridled police brutality, institutional poverty (that still even exists today, he says), demands for better schools, the anti-Vietnam war protests and the support for undocumented immigrants. Q: Thanks for stopping by, Sheila! Can you tell us a little bit about your writing background? I’ve been writing stories since I was a little girl. Looking back, I feel sorry for my classmates, who were a captive audience. (My teacher thought I was the next Jane Austen and always made them listen to my stories.) I majored in music in college but took a ton of English classes and loved creative writing. Sold some articles to magazines when my husband and I were newlyweds. And then, somewhere along the way, I got an idea for a book. And that was that! Q: What fact about yourself that would really surprise people? I used to own a singing telegram company. Great fun! Q: How do you define success in regards to writing and publishing books? That definition changes throughout a writer’s career. There’s always one more mountain to climb. At first it’s “If I could just get an agent,” then it’s “If I could just sell a book,” Then it’s “If I could just make a best-seller list”… “get a movie deal”… “make more money.” I think for me, now, it’s just, “Have people know who I am.” J Success is an elusive thing. Satisfaction, however, that’s a different animal. Satisfaction comes with having written a story well. Satisfaction comes when a reader tells you how much she enjoyed your book. Satisfaction lies in doing something you enjoy. Every author may not find the success she craves, but every author can find satisfaction. Q: Can you tell us about your new book? What’s it about and why did you write it? My new book is set in the fictional beach town of Moonlight Harbor, and gives a character who’s made several guest appearances the center stage. Celeste Jones, who’s kissed way too many frogs has run away to the beach. And there, she meets the perfect man. He’s a minister, for crying out loud. They don’t come any more perfect than that. But then there’s “the killer in room twelve.” And the town gossips. And … that’s all I’m gonna tell you. Q: When you are not writing, how do you relax? Reading, of course! Traveling with the hubs, hanging out with girlfriends and playing games. Loooove games. Q: Please tell us why we should read your book? Q: What kind of advice would you give other authors just getting their feet wet? Wade in hip deep, work hard, and enjoy the experience. This can be a frustrating business, but the rewards of being able to bring characters to life makes it all worth it. Welcome, Patrick! Tell us about The Crimson Calling. Brian W. Matthews grew up in a small town in southeast Michigan. The oldest of three boys, his days were occupied with school, friends, and when he got older, work. Lots of work. He has been gainfully employed every year since 1977, running the gamut from making pizzas to waiting tables to working in a hospital to being a child therapist. He currently works as a financial planner and writes in his free time. He is married with a daughter and two step-daughters. The Conveyance is his third book. The Conveyance can be purchased directly from the publisher at www.journalstone.com or from Amazon. Q: Congratulations on the release of your latest book, The Conveyance. To begin with, can you give us a brief summary of what the story is about and what compelled you to write it? A: I loved watching horror and science fiction movies as a child. In Detroit, on Wednesday afternoons, one of the local channels would show a classic horror or sci-fi movie—Godzilla was particularly popular, but you would also see movies like see 20 Million Miles to Earth or The Fly. I would race home from school each Wednesday to sit in front of the television. This instilled in me a love for the bizarre, so when I started writing, I naturally gravitated toward speculative fiction and the supernatural. My first two novels were mash-ups of horror and urban fantasy and alternate history. When the time came for my third novel, I wanted to branch out. My mind kept returning to 20 Million Miles to Earth and its central question: how did life come to exist on Earth? For The Conveyance, I decided to approach that topic but with a twist, to keep the story fresh for the readers. Q: What do you think makes a good horror or science fiction book? Could you narrow it down to the three most important elements? Is it even possible to narrow it down? A: First, don’t focus on the zombie/alien/monster element of your story. You need to start with people—vividly drawn characters—and their relationships. The zombies/aliens/monsters are simply vehicles to apply pressure on your characters; to test their strengths and weaknesses. That is what makes your readers care about your characters, how they end up rooting for your heroes. If they don’t care about your characters, you’ve failed. Second, the true horror is not the zombie/alien/monster theme: it is the extremes to which your central characters are pushed by these creatures. What is more horrific, a zombie attack or how it forces a mother to kill her child rather than let him or her become an undead fiend? If you’ve done your job well—if your readers really care about the mother and child and their relationship—then that act of mercy will be gut-wrenching; your readers will be far more horrified by it than by any graphic description of a zombie eating a human. This is exactly what made Night of the Living Dead such a hit; the movie was more about the people in the house and how they reacted and interacted under stress rather than the zombies. Third, the readers’ imaginations are far more descriptive than anything you can write. Yes, you can horrify using literary tricks like shifting narrative distance and time expansion and such, but if you over-describe your scene, you rob the reader of his or her input into the story. They can’t make it their own. Find one or two or three (at the most) elements of a particularly frightful scene and describe them, but only allude to the other elements. Let your reader fill in the blanks. Not only will they feel more a part of the story, this will help keep the reader from becoming fatigued. A: I’m not big on story plotting. I typically have a beginning and an end, and I develop certain points I want to reach during the novel’s progression. Then I go ahead and write it. My main fear with plotting is that I will unintentionally telegraph what is coming. If I don’t know what’s going to happen next, how can the reader? In addition, discovering the novel as it progresses helps keep it fresh in my mind; I get excited by developments, my blood starts to race. Writing is a long, painful process, and this excitement keeps me writing with the energy I need to make the story effective. A: The main protagonist is Dr. Bradley Jordan, a child psychologist. I have a graduate degree in clinical psychology and spent many years as a child therapist. While Brad Jordan isn’t me, I used my experiences as a therapist to make him credible. I do utilize character interviews before I start writing, and I did with him. A: This is a harder question to answer because the antagonist is more a concept than an actual person. There are a few big baddies in the story, and similar to Brad Jordan, I did a character interview for each one. But these are mainly highlights. I enjoy coming up with character idiosyncrasies while I’m writing. The trick is to keep them straight and consistent throughout the book. A: Conveyance is written in first person. That’s a difficult tense to use because a writer tends to revert to telling and not showing what is going on. There’s a tendency to overuse visual cues, and this can result in stale prose. I made a conscious decision to show and not tell as much as possible, and to rely on two other senses (touch and hearing) to help expand the narrative stage. Also, I vary my sentence structure and paragraph lengths. Reader fatigue sets in quickly with the same five sentence paragraphs, all fully formed and complete. Vary it up to keep the reader interested. A: Well, as I said in the last question, a writer needs to include descriptions other than the visual. I do use visual as a core descriptor, but I also try to triangulate the narrative stage for the reader by using the senses of touch and hearing. This helps the reader obtain the necessary spatial sense of your setting; your world becomes more realistic. Also, try not to describe too much. (I was guilty of this a lot in my early writing.) Let the readers supply some of the context. This will help pull them into your story and keep them reading, which is the brass ring on this particular carousel. A: I need a theme in order to begin. I can’t simply say “a monster invades a small town in Michigan’s Upper Peninsula” (as in Forever Man). Instead, I need a central struggle for my main character: Izzy Morris, a wife, mother, and the town’s Chief of Police, has always struggled with her role in life, and when her daughter goes missing, she is forced to confront this conflict head-on and grow into the person she was always meant to be. You tell me, which one is the more compelling story? For me, the combination of the two—a basic plot arc and a central conflict for the main character—is what makes me decide to write the novel. A: For me, you really can’t separate the two. For my first draft, I go for the fences. I write like no one is going to read the story so it ends up as big and bold as possible. But what you have after that first draft is a hot mess. That’s fine. The editing is there to turn your hot mess into a logical, artful story. Don’t underestimate what thoughtful editing can do for your story. There is a book called Self-Editing for Fiction Writers. If you’re serious about writing, pick up a copy. Read it over and over. I helped my writing tremendously. A: This one is hard to answer, because success means different things to different people. My vision of success is first completing a novel. I put a year or two of my life into writing it, and finishing it gives me a sense of satisfaction. Second—having people enjoy what I read. I wouldn’t want to put in so much effort and sweat only to have it panned by everyone. Thankfully, that hasn’t happened…yet. I suppose third would be some sort of financial success. It is certainly a gauge of how well received a novel is, but so few people can make a living at writing, and I’m reluctant to emphasize the monetary aspects too much. For most writers, it may never reach the level they think and still be terrific authors. A: I think he was 100% correct. If you want to be a writer, you need to write every day. For some, that includes holidays and vacations. It’s like homework. My wife is a teacher. Each evening, we sit down and do our homework: she corrects papers, and I write. A: As I mentioned earlier, the book Self-Editing for Fiction Writers is an invaluable asset. Another is the book, Scene and Structure, which delves into the framework of a novel. Both are very helpful. Also, join whatever organization represents your genre. I’m a member of the Horror Writers Association and the International Thriller Writers Association. I attend their conferences. That is where I’ve met other writers, picked up ideas about writing, and generally received considerable support knowing you’re not alone with your writing. A: While there are many benefits to writing, it is a difficult and lonely endeavor. You sit for hours by yourself, typing on your computer or writing in a notebook. It can take months to years for your work to see the light of day. Be prepared and be disciplined. In the end, the payoffs can be amazing. The recipient of the Global eBook Bronze Award, Dawn Brotherton is the creator of Softball Scoresheet, a bookused for keeping score during games. She is also the author of two Jackie Austin mysteries, Wind the Clockand It’s the Right Thing to Do, and a contributing author to A-10s Over Kosovo, a compilation of stories about being deployed for Operation ALLIED FORCE. Dawn currently serves at the Pentagon in Washington, DC. as a colonel in the United States Air Force. She enjoys coaching softball, working with the Girl Scouts, and traveling. Dawn and her fighter-pilot-retired husband live in Virginia with their two beautiful daughters. What’s inside the mind of a youth fiction author? I have written adult fiction also, but I really prefer youth fiction. I like trying to see things with my 12-year-old softball players’ eyes. Things don’t always make sense for them in the same way it does for an adult. I have to think of another way to explain it. It helps that I have 13- and 15-year old daughters. What is so great about being an author? Pink fuzzy slippers. That’s what my husband and I always joke about. When I can work from home wearing my slippers, I am happy. When do you hate it? When I have to make corrections from the editor. You reach a point that you just want to be done with a story and go on to the next great idea. But there is always more work to be done, and you have to look at it ONE MORE TIME. What is a regular writing day like for you? There is no regular for me. I am in the Air Force stationed at the Pentagon. I have an apartment in Arlington, but my family is at home in Williamsburg, Va. I drive home every weekend to spend time with them. I try to get my writing done on weeknight evenings, but life gets in the way. Right now it’s a fundraising project for my daughter’s school. Do you think authors have big egos? Do you? Not when it comes to writing. Sure, I can tell you the things I’m good at and that I have confidence in, but that mostly pertains to the Air Force. Editors have a way of keeping a writer humble. How do you handle negative reviews?Defensively at first. I think that’s natural. Then I have to walk away and come back to it later. Then I try to dig out the nuggets that will help me, and let the other stuff go. For example, after my first murder mystery that has an Air Force setting, I had a reader say that the military would never send someone to an assignment for only one year…since I have spent a year in Korea, the rest of his comments rolled off my back. But it did make me go back and rewrite the sections about the military that I took for granted to give them a little more explanation for someone that has no military background. How do you handle positive reviews? They put me on top of the world. Seriously! I walk around with a smile on my face all day long, and I can’t wait to call my sister and tell her. What is the usual response when you tell a new acquaintance that you’re an author?People want to know how I got published. I understand because it was one of my first questions when I met authors. Still is sometimes, but now it’s more about sharing lessons learned with peers. What do you do on those days you don’t feel like writing? Do you force it or take a break? Take a break. I have too many other things going on in my life that distractions are never a problem. It’s making time for writing that is a problem for me. I spent a weekend in a monastery to finish my first Jackie Austin book. Any writing quirks? No. I’m more of a night person than a morning person, but I can sit anywhere and write. I find white wine goes well with softball stories. What would you do if people around you didn’t take your writing seriously or see it as a hobby? I think the only one that didn’t take my writing seriously was my husband. No one else even questioned my desire to be a writer. Now, after my fifth book, I think my husband is finally coming around. Some authors seem to have a love-hate relationship to writing. Can you relate? Not really. I love it. But even too much of a good thing can get old. Sometimes I get really tired of a storyline and tend to rush through to get it over with. Then I have to make myself go back over it several times to get it right. I should just do it right the first time. That’s one reason I think the kids’ books are working better for me. They are a length I can stay focused throughout. Do you think success as an author must be linked to money? No. Easy for me to say because I’m not famous yet. I track my expenses carefully and I know exactly how many books I need to sell to break even. Then I consider it a success, because at least I haven’t lost money. But I think that’s different than being a successful author. Just to be recognized as an author is success for me. What had writing taught you? That there is always more to learn. I am continually finding things I can do better, that I want to try, or that I can teach someone else. Don’t be afraid to try new things. You don’t know what you are capable of unless you try. I do! I have two. I have a wordpress that you can find under www.authorginprice.com and then I have a blog that I like to forget to write in at gintensity@blogspot.com. This interview was originally published on Blogcritics. Ken Lizzi is an attorney and the author of an assortment of published short stories. When not traveling – and he’d rather be traveling – he lives in Portland, Oregon with his lovely wife Isa and their daughter, Victoria Valentina. 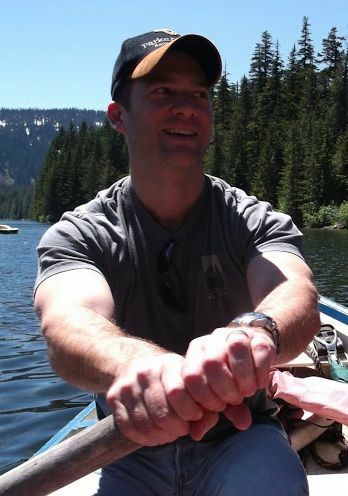 He enjoys reading, homebrewing, and visiting new places. He loathes writing about himself in the third person. Connect with Ken on Facebook and Twitter. In the tradition of Edgar Rice Burroughs’John Carter of Mars, Under Strange Sunsbrings the sword-and-planet novel to the twenty-first century. 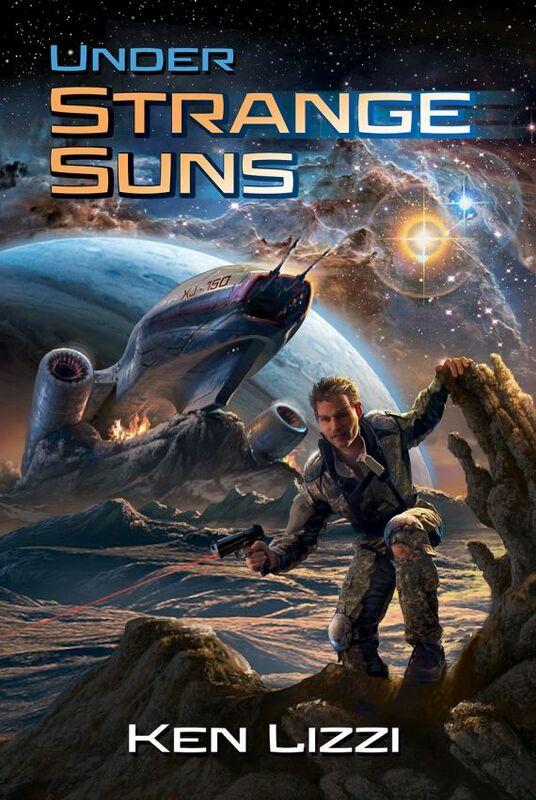 War is a constant, and marooned on a distant world, former Special Forces soldier Aidan Carson learns there is nothing new Under Strange Suns. Q: Congratulations on the release of your latest book, “Under Strange Suns.” To begin with, can you gives us a brief summary of what the story is about and what compelled you to write it? A: Any book on craft is useful. I’ve read several. The good advice stands out by repetition from multiple sources. A: Pay close attention to your editor. Even if you don’t agree with a suggestion, consider the reason for it.